An updated classic with a tiny twist! Featuring a front left chest pocket, crew neck, short sleeves and designed with superior combed and ring-spun cotton, this t-shirt makes a beautiful blank canvas for printing. 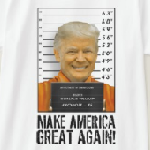 Funny Trump prison mugshot. Make America Great Again!